photo swiped from georgesheehan.com. Please don’t sue me. Thank you. Each one of us is an experiment-of-one. Each is a unique, never-to-be-repeated event. Our talents vary. Our defeats are our own. Our environments offer special challenges. We evolve from a constant interaction between instinct and will, between emotions and reason, between environment and good fortune. Life, like it or not, is a handicap event, and the winner may finish deep in the pack. 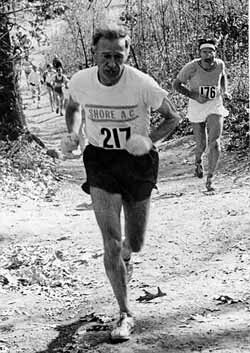 I was lucky enough to meet Dr. Sheehan back in the old days and was a disciple of his running column back then. “Running & Being” is still my Bible. And I think about the experiment of one philosophy almost every day. After 35 years or so of running more or less every day, I still have absolutely no freaking idea what I’m doing. And that delights me. Wouldn’t running be a bore if you could just lock into a system that never changed? Follow a magic formula that was guaranteed to work? Instead, we’re constantly in search. Of training plans, secret elixers, shoes, food, painkillers, rocket fuel, recovery, cross-training, cross-dressing, the perfect Soundgarden playlist. Three days a week? Seven? One-a-day? Two-a-Day? Who knows. Whatever works for you. And whatever that thing is almost certainly won’t work for the guy running next to you. How to find what works? The experiment of one. Repeat as necessary. I was out today on the same old loop. With new shoes and no hooch. Running the opposite direction. A steady slow run rather than the run/walk I’ve been using. Same old daydreaming. Baseball hat defying tradition with the bill in front. A new plan. And an old memory. I waved at folks with my bottle hand rather than my free hand. Always experimenting with the variables. The only thing I know for sure is that I’m going to race a lot this year. Dr. Sheehan said to. And he’s never been wrong yet. Because life is a handicap event, and the winner may finish deep in the pack. That’s me. Today I ran along dodging skateboarders and gulls and thinking about his words. The eternal struggle between emotion and reason. Instinct and will. Today, I won. Experiment of one. This entry was posted in running and tagged happily ever after, life. Bookmark the permalink. I needed this today! Thanks. Today I ran in a camo hat. I did not carry a water bottle, even though I was thirsty before I started. I did not get shot. damn. i gotta get a camo hat. that’s the answer.